Home > Sell Offers > Electrical Equipment & Supplies > Wires, Cables & Cable Assemblies > Other Wires, Cables & Cable Assemblies > Braided flexible metallic conduit system from DELIKON is most suitable for the protectio.. 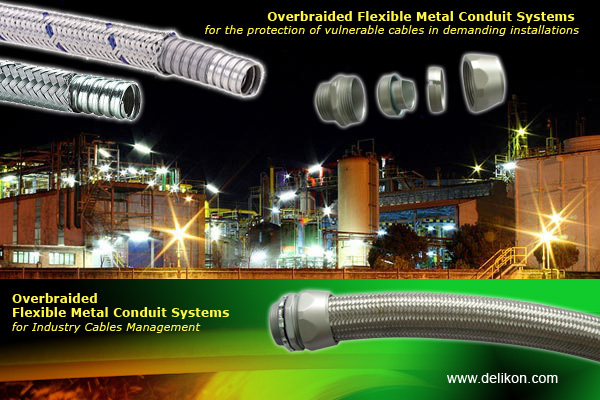 Braided flexible metallic conduit system from DELIKON is most suitable for the protectio.. Braided flexible metallic conduit system from DELIKON is most suitable for the protection of vulnerable cables in demanding installations. Designed for corrosive, chemical and heavy industrial environments, the flexible conduit system is overbraided with stainless steel for added protection, without restricting their flexibility. Braided flexible steel conduit offers high flexibility and high fatigue life, is inherently low fire hazard and provides standard EMI screening for the cables carried within the systems when used with DELIKON fittings. The systems are also suitable for operation in high temperature.